Heat the olive oil in a large pan over high heat. Sprinkle the chilli powder over the shrimp. Place the shrimp in the pan and cook, stirring occasionally, for 2-3 minutes or until shrimp are pink and opaque. Place 18 Old Dutch Crunch potato chips on a platter. 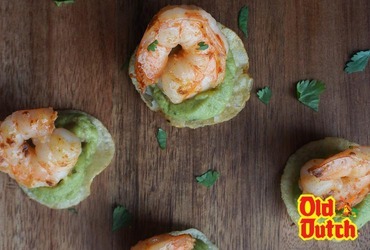 Spoon approximately 2 teaspoons of guacamole onto each one and place a shrimp on top of each chip.